Just as there are a range of pediatric imaging techniques available during life, a similar repertoire is available as part of the fetal and perinatal postmortem (PM) examination. This chapter gives an overview of the spectrum of radiological imaging modalities currently available in perinatal pathology, covering fetal and neonatal imaging. This covers the diagnostic utility of PM radiographs or X-rays, ultrasound, CT, and MRI in this clinical setting. 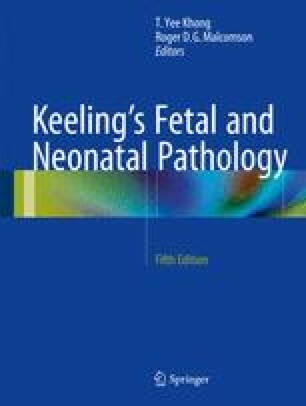 Each modality is presented with an explanation of how the technique works and how the images are acquired, what the relative advantages and disadvantages of each technology are, and how they may be best employed in the postmortem perinatal setting, with reference to current literature on diagnostic accuracy, where available. The need for appropriate training in the interpretation of normal PM changes is highlighted, and future directions for improving PM imaging in this context is outlined. Royal College of Pathologists Working Party on the Autopsy. Guidelines on autopsy practice: scenario 9: stillborn infant (singleton). 2006; http://www.rcpath.org/Resources/RCPath/Migrated%20Resources/Documents/G/G001Autopsy-Stillbirths-Jun06.pdf. Accessed 01 Oct 2014.